Adapting to the customer sounds hard. It doesn’t have to be. Small changes can make a big difference. 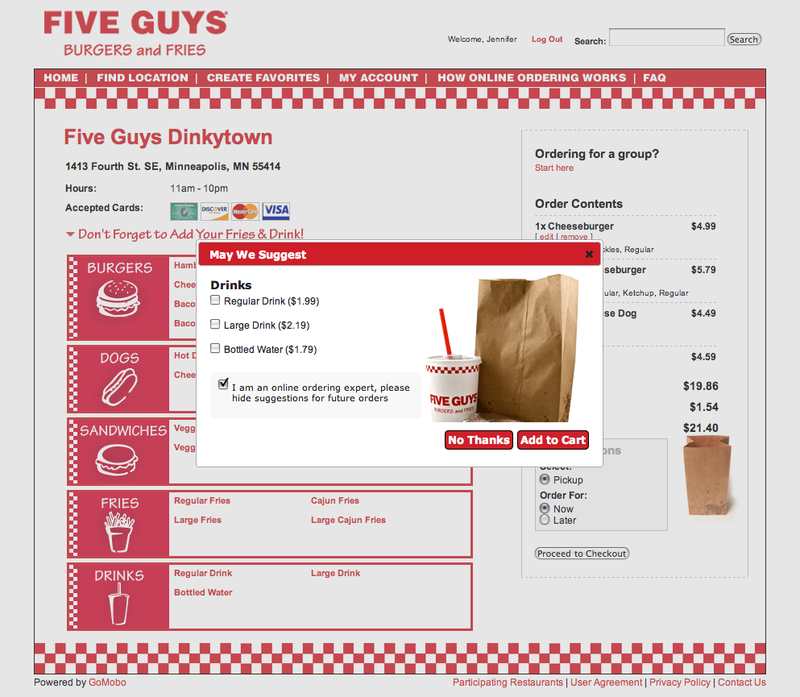 I recently noticed this detail in an experience I had ordering Five Guys take out and using the web site to do it. The order experience includes a question for me. The kind of question that builds customer confidence and rapport with the brand. The experience achieves this with the device of a cleverly written preference question. “Are you an expert user?” If you think you are – skip the suggestions for future online take out ordering. They followed 3 simple rules to make my interaction better with them and show me they are willing to adapt to me throughout the process to make me happy as a customer. 1) Rule One: Ask me a question. In this case, it was actually an upsell ‘ “May we suggest…” but it provides an option to remove suggestions in the future. 3) Rule Three: Retain. Keep the information for later, when I come back – don’t show me the upgrade to a beverage option. Follow these steps 1) Listen 2) Rule 3) Retain and continue to collect and build on that customer information. That’s the future of any business that wants to remain relevant. Well done Five Guys! Quality food coupled with quality experiences will keep the customers coming back every time. It’s really no surprise that a company with such great product would extend its ‘awesomeness’ by making this effort to adapt to customer needs.